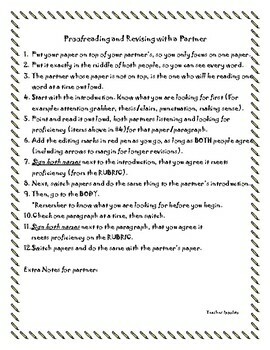 This is a checklist and directions for the process of proofreading and revising with a partner. The partner reads the other person's paper out loud, while both proofread, and add editing marks for revision. I am adding a link to a video so you can see it in action. Specifically proofreading,editing, revising the introduction. Looking for: attention grabber, "mayo" (connecting sentence), and thesis (topic sentence).